Prior to his scheduled appearance on stage with President Donald Trump during today’s rally at Olentangy Orange High School in Lewis Center, state Sen. Troy Balderson, R-Zanesville, made a trip to southern Delaware County to greet individuals supporting his run for Ohio’s 12th Congressional District seat. While attending the Get Out The Vote stop at 7389 Northgate Way in Westerville, Balderson was joined by U.S. Sen. Rob Portman, R-Ohio. During the event, Portman (left) was introduced by Republican National Committee C0-Chairman Bob Paduchik (middle) as Balderson (right) stood in the background waiting to be introduced as the final speaker. Officials at the Delaware County Fairgrounds were just as surprised as ticket holders were on Thursday afternoon when news broke that President Donald Trump’s planned visit to the fairgrounds to stump for Troy Balderson — Republican nominee for Ohio’s 12th Congressional District seat — had abruptly switched venues. Kuhn added the U.S. Secret Service was told the maximum capacity of the Coliseum at the fairgrounds is 1,500 people. Trump’s rally for Balderson will take place at 6:30 p.m. today at Olentangy Orange High School, 2840 E. Orange Road, Lewis Center. Doors open at 3:30 p.m., and as of press time, tickets to the rally were still available at www.donaldjtrump.com. Individuals may register for up to two tickets per mobile phone number, and all tickets are available on a first-come, first-serve basis. President Trump is making the last-minute stop in Delaware County just days before the special election on Tuesday, Aug. 7, to help bolster support for Balderson, who is involved in a three-way race to finish the remainder of Rep. Pat Tiberi’s, R-Genoa, term in the U.S. House of Representatives, which expires Jan. 3, 2019. Tiberi resigned from his 12th District seat in January. On Wednesday, Balderson’s campaign manager, Jenna Knepper, reached out to The Gazette on Balderson’s behalf. 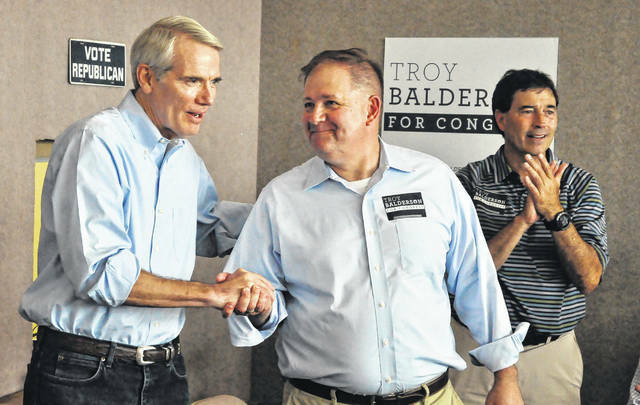 In a district that is predominately Republican, Balderson is facing opposition from Franklin County Recorder Danny O’Connor, D-Columbus, and entrepreneur Joe Manchik, G-Reynoldsburg. Early voting began July 10 for the special election in a district that includes Delaware, Morrow and Licking counties, and parts of Franklin, Marion, Muskingum, and Richland counties. The gap in Balderson’s lead over O’Connor has narrowed from 10 percentage points to one in the past months, according to a recently released poll. “Balderson the Republican has 44 percent support and O’Connor the Democrat has 43 percent support among all potential voters… Joe Manchik — the Green Party candidate who got nearly 4 percent of the vote two years ago — earns just 2 percent,” stated a Monmouth University Poll released on Aug. 1, 2018. O’Connor will make a scheduled stop in the city of Delaware at 4 p.m. today at the Ross Street Park Gazebo, 50 Ross St., to share, listen, and answer questions from voters during a meet and greet. Louise Valentine, the Democratic nominee for the Ohio Senate District 19 seat, said on Friday that she finds it ironic the rally is now being held at Olentangy Orange High School. “While President Trump rallies supporters at Olentangy Orange High School, students, teachers, and parents will remember that it was Education Committee Chairman Andrew Brenner and his fellow Republican lawmakers who allowed ECOT (Electronic Classroom of Tomorrow) to steal over $600,000 from Olentangy Local Schools,” Valentine said. Valentine is challenging Brenner for a seat in the Ohio Senate in the upcoming November general election. This entry was tagged Chris Martin, D. Anthony Botkin, Danny O’Connor, Franklin County Commissioners, Franklin County Recorder, Jenna Knepper, Ohio 12th Congressional District, Troy Balderson. Bookmark the permalink.